Screenshot/CNNEmma Gonzalez and David Hogg. Far-right corners of the internet are baselessly claiming that two students who have been featured prominently since the Florida school shooting are actors, tied to the FBI, or both. The conspiracy has been promoted by the office of a Florida state lawmaker and President Donald Trump’s eldest son, Donald Trump Jr.
A widening conspiracy theory gaining traction on the far right baselessly claims that student survivors of a Florida school shooting who have made a series of TV appearances since last week’s massacre are actors, part of an FBI plot, or both. 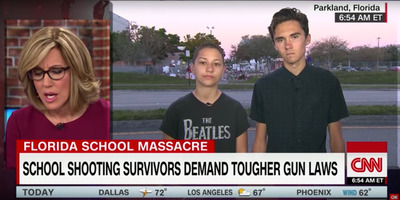 The conspiracies have centered on David Hogg, who has been featured on CNN and CBS following the shooting at Marjory Stoneman Douglas High School, which left 17 people dead and more than a dozen others injured; and Emma Gonzalez, who has spoken out about the need for politicians to enact gun-control legislation. In his case, some far-right outlets have pointed to his father’s being a retired FBI agent to suggest something nefarious in the student’s frequent media appearances. The far-right publication published photos, claiming to be of Hogg, both at a CNN newsdesk and wearing a CNN T-shirt before last week’s shooting. Some people online pointed to footage of Hogg from a CBS Los Angeles newscast last summer, when he discussed how his friend got into a verbal altercation with a life guard, as proof that he was an actor who appears at various crises. Others went after Gonzalez for being “coached” on how to respond to the incident. Emma Gonzalez forgot ask why nothing was done after the authorities were called to the shooters house 39 times or why the FBI ignored the threat. This chick was coached. Democrats used a innocent girl as a pawn. The conspiracies seemed to spill into the ranks of government, too. The prominence of the conspiracies led to Republican Sen. Marco Rubio of Florida publicly condemning those spreading the claims. “Claiming some of the students on tv after #Parkland are actors is the work of a disgusting group of idiots with no sense of decency,” he tweeted. Hogg responded to Rubio’s tweet, thanking him for his comment. The Florida House Speaker Richard Corcoran announced Kelly’s firing late Tuesday: “On behalf of the entire Florida House, I sincerely apologise to the students targeted and again commend them for their courage through this unspeakable tragedy,”Corcoran said. By Tuesday evening, Kelly’s Twitter account had been deleted. The focus on Hogg and Gonzalez comes in the wake of another popular right-wing theory related to the shooting – that the FBI missed warning signs about the Florida gunman because of its investigation into Russia’s interference in the 2016 US election and whether Trump’s campaign colluded with Moscow. Trump claimed over the weekend that this may have been what led to the FBI failing to follow protocol when it received a tip about the shooter, 19-year-old Nikolas Cruz. The FBI has more than 35,000 employees and runs hundreds of investigations simultaneously, and a special counsel outside of the Justice Department is leading the Russia investigation. The bureau, however, acknowledged last week that it had failed in following up on a tip last month about the suspect in the Florida school shooting.